What is the gold standard for Ban Big Money laws? Nobody can accuse Christy Clark and the BC Liberals of not trying. They opened their first, and only, week in Victoria by dangling two juicy carrots in front of the opposition parties — one bill to give the Green Party official party status and one to Ban Big Money. Green and NDP MLAs called their bluff — saying the minority government can’t introduce legislation before it has tested the confidence of the house, which is expected to happen today. However, British Columbians were given the opportunity to see what the BC Liberals propose as fair Ban Big Money laws. The bill included a lot of what we have been asking for — a complete ban on corporate, union and out-of-province donations, including in kind contributions. It also banned funding to provincial parties from federal parties, outlawed loans from banks and capped individual donations to $2,500 for a provincial party and $2,500 for your local candidate. 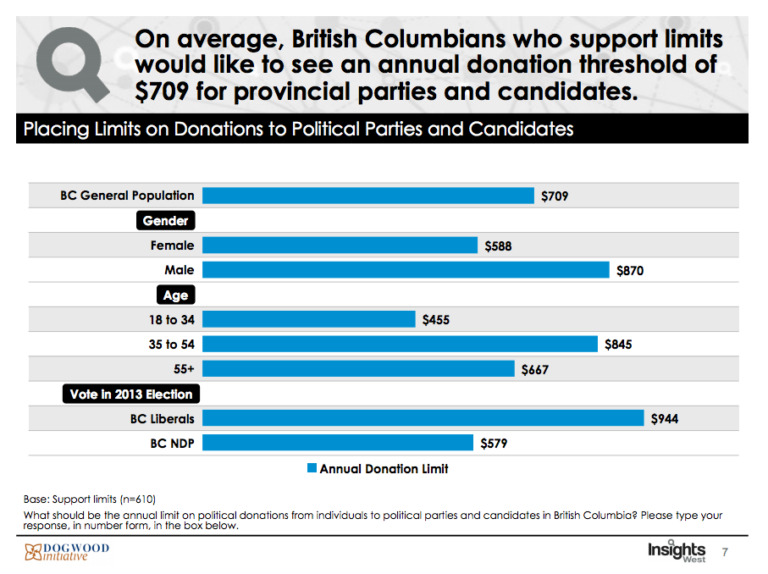 Yes, the BC Liberals have more individual than corporate donors. But the corporations gave a lot more money — $8 million of the BC Liberals’ $12 million haul was from company cheque books. Also, the numbers they provided to the media back in January were way off base. They claimed their total amount of donors (individual and corporate) was 11,200, but only 4,695 donors were disclosed to Elections BC in April. There were, however, just over 10,000 single donations given. If you consider that unlawful donations were returned before statements were given to Elections BC, it could mean the BC Liberals mixed up the numbers. They may have counted each donation as a single donor. Meaning a person who made monthly donations, would have been counted 12 times. By my count, they don’t actually have 9,324 individual donors, they only have 3,246. Still, the BC Liberals have clearly done their homework. Of their 3,246 individual donors, only four per cent donated more than $2,500. If each individual donor gave them the full $2,500, they would have over $8 million dollars — and that’s not even counting the amount corporate executives could personally give in place of their usual company contribution. $8 million is still far beyond the $4.9 million spending cap for parties during an election. $8 million is an unnecessarily large amount of money. And don’t let them talk their way around imposing real donation limits. Clark’s favourite point on the subject is that she refuses to let taxpayers pay for political campaigns. But that’s a false dichotomy. It’s not a matter of only limiting donations OR only forcing taxpayers to shell out. Don’t believe it. What do British Columbians really want? In April 2016, Dogwood commissioned polling with Insights West to find out how British Columbians felt about Big Money in politics. Even we were surprised to find that, on average, British Columbians wanted individual contributions to be limited to less than $709. Even BC Liberal supporters felt less than $1,000 was a reasonable number. We also did an informal Facebook poll and sent an email survey to our supporters to take a quick temperature of our community. Our poll takers largely agreed with the polling we conducted last year — less than $1,000 seems reasonable. What is it like in other places? At the federal level, individual Canadians and permanent residents can donate up to $1,550 each year to a political party, and a further $1,550 to their local candidate. Provinces are allowed to decide their political donation rules for themselves (which is how B.C. got into this mess in the first place). It varies vastly from coast to coast. Quebec has a limit of $100 per donor per year, as a result of the Charbonneau Commission, an inquiry initiated after allegations of corruption. It is worth noting that Quebec was a pioneer of contribution limits, capping individual donations to $3,000 back in 1977. Yet this did not prevent shady contractors from making backroom deals with politicians — $3,000 can still be quite convincing, I imagine — so in 2012, the Charbonneau Commission recommended much stricter political finance laws, including an individual limit of $100. When Ban Big Money laws were introduced in Alberta in 2015, Albertans could give up to $15,000 each year. Last fall, amid national cash-for-access controversies, Alberta further limited its donation amounts to $4,000. That’s still a lot of money — I certainly don’t have an extra $333 each month to give a political party. What else should be included in Ban Big Money laws? We know, and have seen in other places, the stench of corruption can waft in through even the smallest crack. This means a robust, detailed law — the gold standard — must address all of the potential gaps: stopping cash-for-access events with ministers and the premier, tougher regulations on lobbyists, limiting how much political parties can spend during and before the election period, and setting an appropriate limit for individual contributions. Anonymous donations should be completely illegal. We need to make sure local candidates and leadership races are subjected to the same regulations and ensure transparency, with real-time disclosures, for the whole system. We need to limit loan guarantees and donations from unincorporated associations. We also need to address reimbursements of candidate and party expenses. Basically seal up all the cracks and scrub the Legislature clean. But there is more. Quebec and the feds have a good system (well, better than other places in any case) because they went one step further. The Charbonneau Commission and the Gomery Inquiry helped determine how corruption influenced public policy and helped exterminate it. Yes, British Columbians need answers (Did Big Money influence decision-making? ), but we also want to ensure that our new system is the gold standard: where are the loopholes and how can we close them? In the long run taxpayers paying for democratic campaigns and elections will save them not only money, but big political headaches. I’m so glad we finally have a chance to close this Gate to Greed. Let’s get this done as soon as possible and let’s do it really thoroughly! There’s no doubt that, without even workable donation laws, BC is way behind the times and at great peril of inviting corruption – if it’s not here with us already. The time for such legislative changes is NOW! The confluence of opportunities will perhaps never be better – unless we also have a Charbonneau Commission. Both the NDP and Greens have made the right noises during the May election campaign, and even the Liberals’ ‘clone speech’ embraced the need for restrictions on political donations, so all three parties are (evidently) aligned on the subject. The Law must also apply to Municipal Elections and in-kind contributions need to be included in any legislation to clean up the currently corrupt system. I have been told by a union executive that collective agreements with government and crown corporate unions define ‘election’ volunteer work as ‘union business’ and ‘union business’ is paid work. From the party/candidates perspective this kind of contribution is considered an in-kind contribution and no monetary value is attached or disclosed in post election Financial Disclosure documents In other words, as I’ve been given to believe, currently unionized public servants are being paid for their election volunteer work. by their employers…the public. If this is the case a retroactive disclosure of any such contributions for the past Provincial and Municipal Elections should be required before anyone in BC goes to the polls for an election. Just my opinion. At this time the survey works ok but it needs input from other countries for sure. However, that’s a huge admin job and we don’t have time right now, I guess. but we could try learning from history instead of repeating it, by now! ?